In the closing months of the 1970's, electronics Goliath Texas Instruments joined the rapidly swelling ranks of home computer manufacturers. 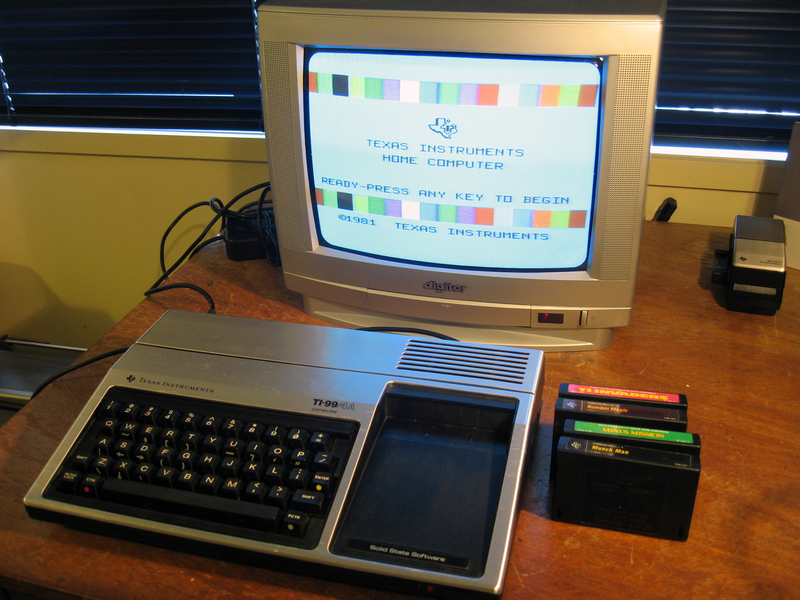 On offer was the TI-99/4 which was followed by the more capable TI-99/4A in 1981. Given TI's pedigree the move seemed a natural one. Despite the mouthful of a name the TI-99/4A had good specs for the time. A full-stroke keyboard, 16k of user RAM, a text mode with 32 characters by 24 lines and a 192 X 256 graphics mode with 16 colours. It had the normal suite of optional peripherals such as a data cassette recorder and modem. A speech synthesizer, seen unplugged in the top right of the photo opposite, was a popular option. Disk drives could be used with extra supporting hardware. Like any good home computer of the day it made provision for cartridge-based software, joysticks and had an RF interface so both kids and adults could monopolize the family TV. It was the first domestic computer with a 16-bit processor, although the hardware design didn't capitalize on the potential speed gains. Indeed, the TI-99/4A BASIC was well-known for being much slower than other models around at the time. Unfortunately for TI, the home computer market from 1981-1983 was a highly competitive environment. Almost every electronic manufacturer who could cobble together a manufacturing plant was trying to convince price-sensitive parents they needed these technical wonder gadgets in the home for the sake of their kids' future if nothing else. Texas Instruments famously entered into a price war with Commodore International (makers of the VIC-20 and Commodore 64), which eventually saw the TI-99/4A being sold for less than it cost to produce! The situation was untenable and in late 1983 TI withdrew from the home computer market completely. This was sweet revenge for Commodore, who had almost been bankrupted by TI in similar "Digitial watch and calculator wars" in the mid-1970s. It's partly due to this notoriety as an early casualty of the home computer wars that I wanted a TI-99/4A in my collection. 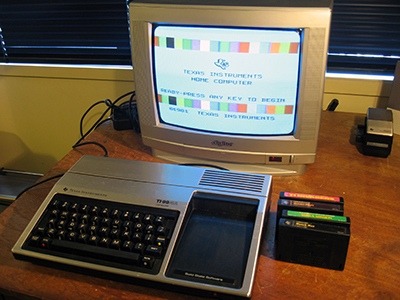 Although the computer was no longer being produced when residual stock hit New Zealand stores in 1984, the TI-99/4A was popular model in the U.S.A. and remains a nostalgic favourite in that part of the world.